VANCOUVER - A young woman who hailed from "humble beginnings" in the East African country of Tanzania left behind her home and a three-year-old child for the promise of earning $200 a month in a Vancouver-area salon, only to be forced into domestic servitude with no pay and little means of escape, the Crown alleged Tuesday at a human trafficking trial. 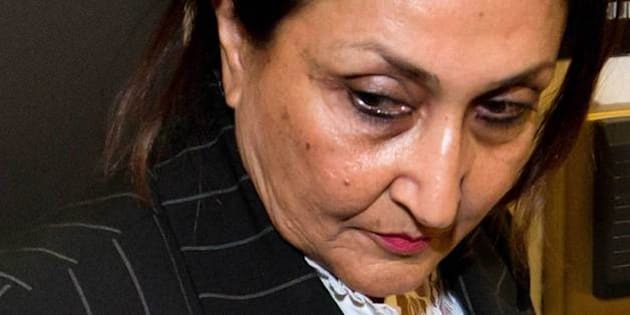 The employer, Mumtaz Ladha, a 60-year-old Canadian citizen who split her time between West Vancouver and Tanzania, is now on trial for several human trafficking-related offences. She is accused of lying to immigration officials in Tanzania to bring the young woman to Canada and then employing her illegally after they arrived. Ladha and the young woman, whose name is covered by a publication ban, arrived in the Vancouver area in August 2008, when the Crown alleges the victim was handed a maid's outfit and set to work. The young Tanzanian woman stayed at Ladha's home in a posh area of West Vancouver until she fled to a shelter in June 2009. Ladha's trial began earlier this month, but the Crown delivered what it described as a mid-trial opening statement on Tuesday, outlining the facts it intends to prove at trial. The trial is expected to hear testimony from the victim later this week or early next week. "(The victim) will testify about her humble beginnings in Tanzania and the circumstances that led her to meet Mumtaz Ladha," Crown counsel Simon Charles told a B.C. Supreme Court judge, who is hearing the case without a jury. Charles said the alleged victim was living in Dar es Salaam, a large city on Tanzania's east coast, when her mother died, prompting her to leave home and look for work. She was eventually introduced to Ladha and became one of several domestic servants — a job she held until August 2005, when she had a baby, said Charles. The young mother stayed home with her child for about a year before she started searching for work again. She ran into Ladha on the street and was invited to work as a cleaner in a salon Ladha owned, said Charles. The alleged victim spent the next year cleaning at the salon while learning how to perform manicures, pedicures and massages, said Charles. In 2008, Ladha asked the woman to accompany her to Canada for six months, but she declined the offer, explaining that she had to work to care for her young child, said Charles. Ladha responded by sweetening the offer, said Charles, promising to hire the alleged victim at a salon in Vancouver at a monthly salary of C$200 — more than four times what she had been making when Ladha originally hired her as a servant in Dar es Salaam. "Although (the alleged victim) was hesitant to leave her son for six months and to travel to Canada, the promise of $200 a month was a chance to earn money for her family," said Charles. Ladha filled out the paperwork for the young woman to obtain a passport and a Canadian travel visa, said Charles. On the visa application, Ladha indicated the alleged victim would be in Canada for three months helping Ladha with a medical condition, he said. Ladha and the alleged victim, who was in her early-20s at the time, arrived in Vancouver in August 2008, where they were met at the airport by Ladha's daughter. The alleged victim was taken to Ladha's home in West Vancouver's British Properties, an area known for its panoramic hillside views and luxury homes, where she was immediately ordered to start unpacking boxes, said Charles. As it turns out, there was no salon in Canada and no job as a manicurist waiting for the young woman, who had a Grade 7 education and could not speak English, said Charles. Instead, the alleged victim was handed a maid's outfit and forced to work long days caring for the home with no pay, said Charles. Her passport was kept locked in a safe in Ladha's bedroom, he alleged. "Without a passport, with no money, limited ability to speak English and no connections to the community, (the alleged victim) had no means of removing herself from the situation she found herself in," said Charles. About six months after their arrival, Ladha returned to Tanzania, leaving the alleged victim in West Vancouver with Ladha's daughter. At some point, the alleged victim befriended a woman who lived nearby. The friend, who is expected to testify as early as Wednesday, helped the alleged victim flee to a women's shelter in June 2009. The police became involved soon after, visiting the Ladha home and retrieving the alleged victim's belongings and her passport. Charges against Ladha were announced in May of 2011. Ladha is standing trial on four counts under the federal Immigration and Refugee Protection Act: human trafficking; employing a foreign national without authorization; misrepresenting facts to the High Commission of Canada in Tanzania; and misrepresenting facts to Citizenship and Immigration Canada. Ladha has pleaded not guilty.